Sale ends 11:00pm (AEST) 6 May 2019. Valid for travel from 27 April to 20 September 2019. The travel period has black-out dates: 5 - 7 Jul 2019. Located on the lower levels of the resort with city or hinterland views. Located on the middle levels of the resort with ocean and hinterland views. Located on the lower levels of the resort with city or hinterland views and 2 bathrooms. Located on the middle to high levels of the resort with ocean and hinterland views and 2 bathrooms. 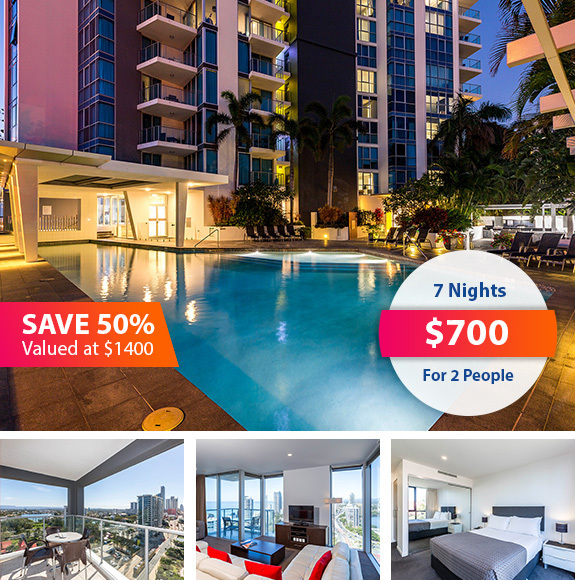 Located just a short walk from the thrills of Surfers Paradise and the pristine, sunny beaches of the Gold Coast, Artique Resort is a great place to relax and indulge. The resort offers a fantastic array of facilities including an outdoor heated pool, partly covered for your convenience, spa, sauna and steam room as well as a poolside barbecue and entertainment area to cook up a feast. If you are feeling active, there is a fully equipped gymnasium or if you prefer to relax, a private theatrette. There is full building security as well as secure undercover car parking. Spacious 1 and 2 bedroom apartments are fully air conditioned with ducted air conditioning, have a fully equipped gourmet kitchen and high speed internet. The apartment interiors offer chic and modern design with luxurious finishings and decor, whilst the balconies offer north or south facing panoramic views of the ocean, hinterland and Surfers Paradise. State-of-the-art guest facilities ensure plenty of enjoyment and relaxation, while safe, patrolled golden beaches are just metres from your door. World-class shopping, cafes, family entertainment and the finest dining experiences on the Gold Coast are all just a short stroll from the resort. A private theatre room will satisfy your in-house entertainment needs providing you with hours of satisfaction in between your holiday activities. Families or small groups can bring along their own DVD and reserve for private use. Artique features a unique virtual golf simulation room for avid golf guests to test their skills with. Guests must hold a current golf club membership to access this facility. On arrival you will be required to supply a credit card for $200 pre-authorisation for bond / security purposes. Should a credit card not be available, you will be required to pay a $200 cash bond and a photocopy of your driver's license. This property does not have the policies, procedures or resources to accommodate the unique needs of school leavers bookings during the annual Schoolies period. In particular, it does not offer adequate resources with regards to security personnel to guarantee the safety of this unique group. For this reason, Artique reserves the right to reject bookings from school and / or university leavers for this entire school leavers period.